The Tarot trump for the 25th path of Sagittarius, the Intelligence of Probation, is Art XIV, depicting the Holy Guardian Angel performing a work of transmutation on the soul. The full title of the trump is The Daughter of the Reconcilers: the Bringer-forth of Life. This trump was traditionally titled Temperance. It depicted an Angel pouring liquid between blue and red vases. In the Tarot of Aleister Crowley and Frieda Harris, the card has been retitled Art. It is the art of alchemy that is portrayed here. The trump corresponds to Sagittarius, the mutable fire sign of the Zodiac. The signs of the Zodiac are best understood as pairs; Gemini is opposite and complementary to Sagittarius the Archer or Centaur. In the Tarot trump for Gemini, the Lovers, pairs of opposites are shown: black and white, silver and gold, good and evil, male and female. 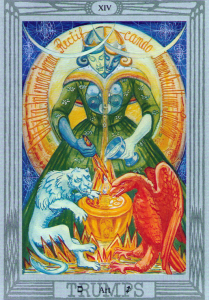 The red and white tinctures of alchemy are symbolised by a lion and an eagle. In the trump for Sagittarius all these opposites have exchanged places; the red lion has become white, the white eagle has become red. The Holy Guardian Angel, clothed in green and wearing light and dark masks, pours fire and water into a golden cauldron. In the cauldron she mixes drops of blood from the paw of the lion and tears from the mouth of the eagle. The link between Gemini and Sagittarius is the Arrow of Will. A stream of light, guided by an arrow, rises upwards from the cauldron until it reaches the heart of the Angel; from there, the light branches into a rainbow that falls over her shoulders like a cape. Whereas the card for Gemini depicted a mystic marriage, the card called Art symbolises the consummation of that mystical union. The spiritual idea as expressed by Crowley in the Book of Thoth (pp. 103) is that an incomplete element is spiritualised only through the assimilation of its equal and opposite. The means of accomplishment is written in gold lettering upon a large orb, shining like the Sun behind the Angel: Visita Interiora Terrae Rectificando Invenies Occultum Lapidum. ‘Visit the interior parts of the earth: by rectification thou shalt find the hidden stone.’ Alchemists described the stone of the wise or universal medicine variously as a stone, a powder or a tincture. It may be divided into silver and gold or red and white, but its essence is always the same. That which is Below is like unto that which is Above, and that which is Above corresponds to that which is Below, to accomplish the Miracle of the One Essence. The 25th path of Samekh connects Tiphereth, the sphere of the Sun, with Yesod, the sphere of the Moon. The title of the path (Sepher Yetzirah) is the Intelligence of Probation or Trial. It is only by test, experiment, trial and experience that the harmony and beauty of Tiphereth can become permanently fixed in Yesod, the Foundation in the natural soul or body for the Ruach, the intelligent mind. The operation of the Great Work can only proceed if the aspirant practices detachment, indifference to phenomena, and refuses to identify their self with the actions of the personality and the events that seem to be taking place around. The ‘indifference’ is not to be thought of as lack of attention; in fact, the level of observation is intensified through the meditation practice. The magical power of the 25th path is the Power of Transmutations. The deity we invoke when the Sun enters Sagittarius is the Egyptian Nephthys, sister of Isis. Nephthys is the principle of dematerialisation (waning moon) and dissolution of the ego or ‘body of the king’—a process that must begin no sooner than a foot is placed on the path. For that reason, in traditional mysticism the Intelligence of Probation is often likened to a Dark Night of the Soul. The 25th path crosses the veil called Paroketh. Most, if not all religions, have sensibly avoided trying to define ‘God’. As soon as the Absolute is explained in dualistic terms, ambiguous limitations are imposed. No less the Holy Guardian Angel, a term long used in the Western Mystery Tradition. The Holy Guardian Angel is the Messenger or Communicant of the divine Absolute. As with God, it is wise to limit ourselves to negative terms—what the Holy Guardian Angel is not. Scriptures and magical grimoires use allegory to convey truth that cannot be put into words. Promises of unlimited treasure, of worldly and supernatural powers, have lured many fools while at the same time providing evidence for the sceptic that it is all superstitious nonsense. There are some deities that closely fulfil the divine messenger role of the Holy Guardian Angel, of which a few are: Dionysus, Jesus, Krishna and Horus. These names are perhaps religious and cultural modifications of one type, a god that is able to appear (or incarnate) in human form. The Vision of the Holy Guardian Angel is assigned to Malkuth, yet the Knowledge and Conversation of the Holy Guardian Angel is the exclusive task of an Adeptus Minor. It is impossible not to use mystical allegory: the ‘bride’ or soul in Malkuth, the daughter or princess of the Kingdom, must be wedded to the ‘prince’ or Holy Guardian Angel in Tiphereth. Experiencing the solar centre of the Hermetic Tree does not involve ordinary clairvoyance or magical powers, so-called. The ‘Heart Girt with a Serpent’ is a metaphor for the impersonal cosmic principle fully realised as the sole source of personal existence. It is that which the ancient Egyptians called ‘Intelligence of the Heart’. This cannot be arrived at through a process of reason or argument unless the sword of reason is turned against itself. It is said that all paths end in Mystery. Surviving the ordeals of initiation defines the path in a way that only the individual can truly understand. When the knowledge is firmly embedded in the heart through prolonged meditation, aspiration and vigilance, and is carried through into the daily life and work, then Nuit’s ‘kiss’ may at last confer the gift of certainty to her chosen one. 1. From the ancient Egyptian Emerald Tablet of Hermes Trismegistus. 2. Kenneth Grant, Nightside of Eden, Part Two, Chapter 2 [Starfire Publishing].